This page shows the effect of stacking multiple film images to reduce noise (grain) and to increase detail. The target shown is a small portion of the "east arm" of the Orion Nebula - M42. All images were 20 to 40 minute exposures on un-hypered Kodak LE400 and were registered, cropped, and color matched using Registar version 1.05. I should also note that all images were taken under 4.2 mag skys. The images are at my scanner's (HP S20xi) native resolution so no scaling has been done, these are just highly cropped. The result is obvious, as more images are added to the final image, the grain disappears and the details start to "come out of the fog". 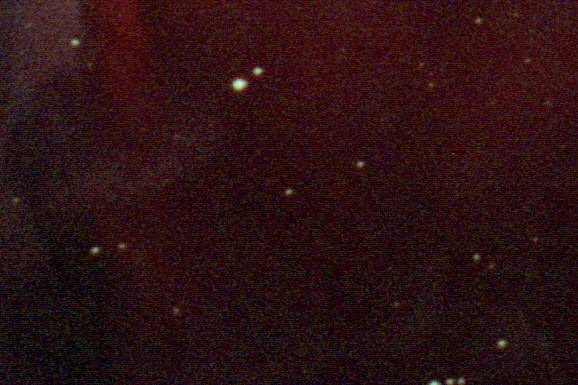 Very dim stars that are nearly invisible in some of the single frames are very obvious in the stacked images. There are a couple of other interesting facts as well. In the "Eight Image Stack" there are some frames that are very grainy (4,7,8) as well as a one with poor tracking (7), two with scanning artifacts (1,2), and one with a streak (6). Surprisingly, adding these otherwise bad images still improve the final image (scroll down). The other point is that it basically requires a doubling of number of images to gain about a 1.4x improvement in grain to detail ratio (1.4x is about right if the grain and signal is approximately equal in all images). In reality, the improvement will be somewhat less the 1.4x as the number of frames are doubled. To see the individual source images used for these stacks click here.